Classical Rayleigh Ritz Method is named after Walther Ritz and Lord Rayleigh and is widely used. Classical Rayleigh Ritz Method is a method of finding displacements at various nodes based on the theorem of minimum potential energy. Trial functions are defined for sub-domains. Generally, the use of values of space variable at the nodes as unknowns. Firstly, for the sub-domains, there will be algebraic equations with some known and unknown coefficients. 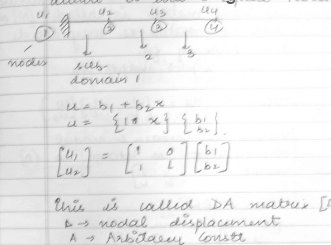 DA matrix is formed from these equations where D is nodal displacement and A is any arbitrary constant. With the help of DA matrix and nodal displacements, displacement at any arbitrary point can be found and the matrix formed is called as Shape function matrix. Further, strain and stress can also be found if displacements are known. This method will also give the variation of the displacement with different slopes in the different domains in the form of a line diagram. The Detailed explanation of the topic is given in the pdf embedded below with solved examples.